Marsh, James H.. "Howie Morenz". The Canadian Encyclopedia, 04 March 2015, Historica Canada. https://www.thecanadianencyclopedia.ca/en/article/howie-morenz. Accessed 18 April 2019. On 28 January 1937, Morenz sustained a broken leg that proved to be a career-ending injury. In the months that followed, his health gradually declined, culminating in his death on 8 March of the same year. Howarth William Morenz, "Howie," hockey player (b at Mitchell, Ont 21 Sept 1902; d at Montréal 8 Mar 1937). 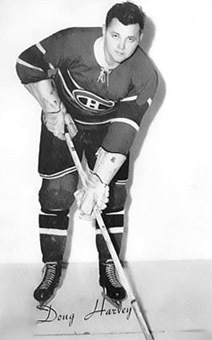 He played junior hockey in Stratford, Ontario, and joined the MONTREAL CANADIENS in 1923. A swift skater, deft stickhandler and prolific scorer, he was a popular idol in Montréal. He helped stir interest in hockey in the US and was traded to the Chicago Black Hawks (1934) and then the New York Rangers before returning to Montréal (1936). On 28 January 1937, Morenz sustained a broken leg that proved to be a career-ending injury. In the months that followed, his health gradually declined, culminating in his death on 8 March of the same year. Physicians state a heart attack as the cause of his death but many suspect that the ensuing depression following his forced retirement was what really killed him. His death was mourned across Canada, and thousands filed past his bier, placed dramatically at centre ice in the Montréal Forum. Morenz scored 270 goals and 467 points in 14 seasons, led the NHL in scoring in 1928 and 1931 and won the HART TROPHY (most valuable player) in 1928, 1931 and 1932. 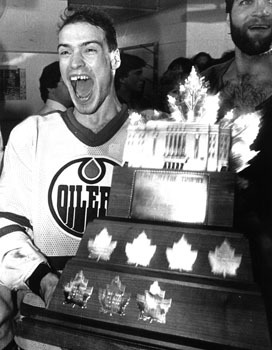 He is a member of Canada's Sports Hall of Fame and Hockey Hall of Fame.